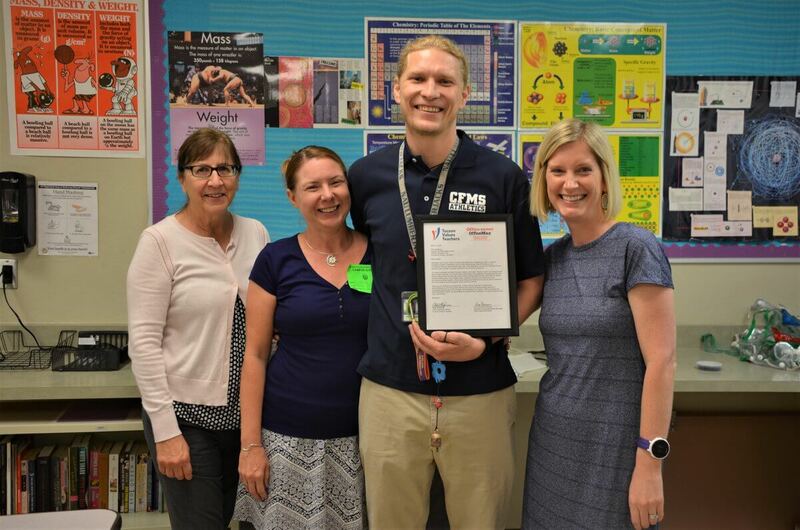 Corona Foothills Middle School teacher, Steven Sasser, received the May 2018 Teacher Excellence Award during Teacher Appreciation Week. Currently in his third year at Corona Foothills Middle School, Mr. Sasser teaches both 8th grade science and 6th grade extended learning science classes. 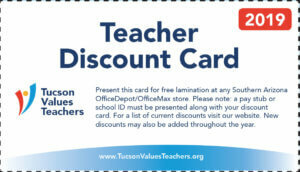 The son of two former educators, Mr. Sasser earned his master’s in elementary education at Northern Arizona University. After a long-term sub position in Eloy, followed by a year at a local charter school, Mr. Sasser made the move to Vail Unified School District. In addition to his classroom responsibilities, Mr. Sasser is the advisor for the Pokemon Club and coaches basketball and volleyball. As part of the Teacher Excellence Award, Mr. Sasser received flowers and a plaque from TVT, a $100 gift card from Office Depot/OfficeMax, a mini bell donated by Ben’s Bells, and a gift card to Humble Pie! He also received $250 cash courtesy of Tucson Electric Power and Helios Education Foundation.